Each of the friends we serve has a Support Plan and a Support Coordinator. The Support Plan outlines their individualized learning goals, life objectives, and in some cases – their dreams. Our staff work with our clients to help them achieve what they’ve put to writing in the plan. We also offer Adult Basic Education classes in partnership with Daytona State College. Every person we serve is encouraged to learn, grow, and achieve new heights in their day to day lives. Our friends – all of them – receive vocational training and the opportunity to earn a paycheck. About 20% of our friends work in the community – but most choose to work on campus in our Work Activity Center.. Here, they find themselves in a supportive environment among friends where they are encouraged to learn and work at their own pace. They are all learning valuable life skills, while also putting a few dollars in their pocket. As part of their education, we provide numerous opportunities to tour local businesses and participate in job shadowing. Our clients really are our friends – and for that reason, their health is important to us. We provide healthy eating choices in our cafeteria, along with plenty of opportunities for exercise and physical activity. The very act of showing up at our programs ensures that their lifestyles are more active as opposed to the sedentary existence that most would live if they stayed at home. 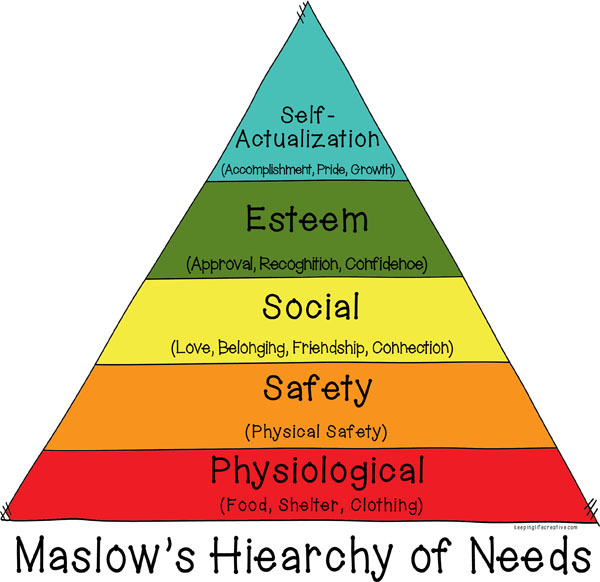 Maslow’s Hierarchy explains that all human beings have needs. These needs begin with the Physiological (food, water, rest, clothing), and move to Safety, Social, Esteem, and finally Self-Actualization. We believe this very much describes our culture. Our friends come to us and find a loving, nurturing, positive environment where they are encouraged to grow and blossom. They find themselves a part of a safe community where they are accepted and embraced – but also encouraged to dream, to learn, and to grow.